Now that the Christmas decorations got put up, I’ve been concentrating on some areas of The Cottage that need some cleaning and organizing. The Library, Pantry and some of my cupboards are in bad need of organizing and cleaning. Today, I cleaned and organized the cabinet that contains my baking dishes, Crock-Pots and tea. Yes, my tea! I have an entire part of my cabinetry dedicated to storing loose-leaf tea, which needs to be stored in an area where direct light does not hit and the temperature is consistent, stored in air-tight containers. 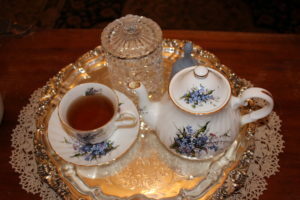 I have been very fortunate to have the space to dedicate to my loose-leaf tea, but I also make it a priority. Tea is very important to me culturally and socially, and it has been proven that tea in all forms has health benefits that are crucial to our well-being. My preference is black tea, but green and white teas are also present in my larder. I read recently about purple tea and can hardly wait to try it! Herbal teas are also present, and they, too, have great health benefits. Would you like a suggestion? For black tea, it’s Irish Breakfast, a robust blend most Americans would appreciate. For green, try gyorku, and for white, I love Huckleberry White by Kitchen TLC blended right in Montana in Bozeman. For herbal, I enjoy chamomile, because it aids in relaxation and settling of the stomach. All tea has benefits, so choose the one you enjoy the most and relax!